Essential Treatments in Cardiovascular Chinese Medicine includes information on the basic medical sciences of blood lipids, clinical significance, diagnosis, and treatment methods. It also covers TCM differentiations, diagnosis, treatment principles, and methods. 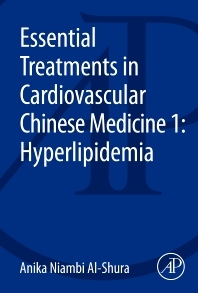 In recent years, TCM practitioners have not been specifically trained in treating patients with hyperlipidemia. The book gives a detailed explanation of cholesterol problems and offers Chinese medicine as a solution. This book is intended for US-based licensed TCM practitioners as well as cardiology researchers. This book is intended for U.S. based licensed TCM practitioners, cardiologists and researchers of TCM and cardiology. Anika Niambi Al-Shura, MSOM, PhD is originally from Louisville, KY and founded Niambi Wellness Institute, LLC in 1994. Since that time Dr. Anika has been transitioning practice perspectives from alternative healthcare in medical massage therapy to integrative Chinese medicine. In 2004, Dr. Anika earned her bachelors in Professional Health Sciences and masters degree in Oriental Medicine from East West College of Natural Medicine, travelled to China and continued her 10 year medical study and a career in teaching until 2014. Dr. Anika studied at Shandong University of Traditional Chinese Medicine Hospital, Jujiiang Medical University Hospital and Tianjin University of Traditional Chinese Medicine Hospital. She earned study certificates in Chinese internal medicine, internal medicine and general surgery, and a specialty in Chinese medicine cardiology. During her teaching career, Dr. Anika taught medical subjects and research at Shandong Medical University, Jiujiang Medical College and Tianjin Medical University. While teaching, she completed her dissertation on Integrative Cardiovascular Chinese Medicine, and received her doctorate in medical education in 2014. Since 2014, Dr. Anika has been living in Florida, where she is developing the Integrative Cardiovascular Chinese Medicine (ICCM) study program at Niambi Wellness. There are 8 courses in the program which were approved by NCCAOM and Florida Medical Board of Acupuncture for awarding CE credits to licensed practitioners. The course textbooks for the program were published by Elsevier Academic Press. Eligibility and registration information can be found at www.niambiwellness.com.